Here are websites and/or notes on what a few of our current students in art history and studio art are doing. Please check our page of recent graduates and our page of notable alumni, too! UA studio graduate student Francesca Baldarelli’s art work is included in the group exhibition, Clay Review 3, at the Abernathy Arts Center in Sandy Springs, GA, January 27-February 23, 2017. 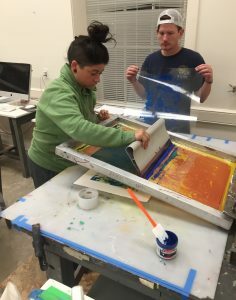 Engineering-turned-studio art major Brandt Deeds built new bicycle racks at 4th and 23rd for the City of Tuscaloosa, designed by recent graduate Alli Sloan. Deeds will design and build another set at Government Plaza in 2017. He and New College major and art student Nick Jackson together made their first sculpture for the Nucor Charity Auction, which brought in $12,000 to Children’s of Alabama. 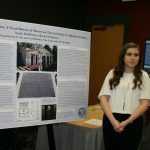 Undergraduate art history major Nadia DelMedico presented her research poster titled, “Too Close to Home: The History of Slavery on The University of Alabama’s Campus” at the 22nd Annual Graduate Student Symposium in Art History’s new undergraduate poster session. Graduate student in art history Emilee Hendrickson’s paper on Cardinal della Valle’s Portrait Medal was accepted to the Fifth Annual Symposium on Medieval and Renaissance Studies at Saint Louis University in St. Louis, Missouri, June 19-21, 2017. Tobias Layman and Francesca Baldarelli present their MA exhibitions in the Sella-Granata Art Gallery, February 2-16, 2017. Rebecca Teague is a graduate teaching assistant in art history. Her major concentration is Italian Renaissance art and her minor is contemporary art. She said, “I’m interested in the ways in which Renaissance methods, theories and conceptions of art continue to shape and influence the contemporary art world which so badly wants to pry itself from the past.” Teague recently presented her research paper, “Nanni di Banco’s St Luke as a Statement Against Albizzi Control,” at the 22nd Annual Graduate Student Symposium in Art History, where she won a second place Harrison Award for Excellence in Research – Graduate Paper Presentation for her paper. During the summer of 2017, she interned as a Museum Collections Volunteer at the Alabama State Department of Archives and History in Montgomery.